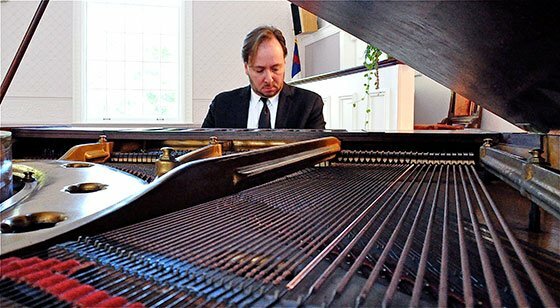 The Frederick Collection’s recent acquisition, a 1928 Érard, gave its local debut Sunday in the Historical Piano Concerts series in Ashburnham. For this auspicious occasion, the Fredericks welcomed for his third appearance on their series, Gershwin specialist, DC-based Thomas Pandolfi. He opened with Grace Castagnetta’s (1912-1996, herself a concert pianist, though little remembered today) 1945-46 reduction/transcription for solo piano of George Gershwin’s Concerto in F major (1925), and closed with Gershwin’s own 1927 reduction/transcription of his 1924 Rhapsody in Blue. He opened the second half with the composer’s Three Preludes of 1926, and offered an encore of improvisations on three of Gershwin’s songs: “Our Love is Here to Stay,” “The Man I Love,” and “I Got Rhythm.” Hence, for Gershwin lovers, it was a bonanza, and a superbly rendered one that also displayed the glittering musicality and the power of this piano. Pandolfi played the entire program from memory and spoke about each piece before performing it. Sprinkled in between the Gershwin works were short works by French composers written in the preceding two decades, all of which were equally beautifully played and which showed off the quieter side of the instrument’s broad range. From the over-the-top bravura of the Concerto in F, which opens with a Charleston dance rhythm Allegro, proceeds to the bluesy Adagio and Andante con moto, and concludes with the rousing, raucous Allegro vivace that suggests street noise, we moved to the serene calm of Claude Debussy’s best known piece, the Clair de lune, movement 3 of his Suite bergamasque, written between 1890 and 1905, with this movement the last composed before the 1905 publication. From there, we moved to the perky Trois mouvements perpétuels (Three Perpetual Motions) by Francis Poulenc composed in 1918, the year Debussy died. Like many of Poulenc’s early works, they are bright, light, and infected with humor. The first half closed with Marie-Joseph-Alexandre Déodat de Séverac’s most famous work, Pippermint Get, Valse brillante de concert, composed in 1907. “Famous” is, of course, a relative term in this instance, because it is little played, even in France, and nearly unknown here today; it was a delight to hear it on this piano. Séverac (1872-1921) was from Languedoc and ultimately returned there to his family’s castle and estate after his years in Paris. The title (That is not a typo; it is pronounced ‘peep-air-mint zhay’.) comes from the name of a mint liqueur manufactured by the Frères Get distillery that was popular in France in the 19th century and up to WW I and still made, invented by Jean and Pierre Get in 1796! You can find images of several old advertising posters online. The waltz is light-hearted, a waltz for the Jazz Age, and was dedicated to Cyprien (“Cipa”) Godebski, who, with his wife Ida, hosted an important salon in their Paris apartment and their country home in Fontainebleau (“La Grangette”) frequented by many composers including Maurice Ravel,whowas among their best friends. He composed several of his works in La Grangette, and stayed with them when he came to Paris in later years. (Some of his works are dedicated to the Godebskis and their two children; Ma Mère l’Oye was written for and dedicated to the latter. In the second half, the interspersed works were Debussy’s Prelude La cathédrale engloutie, Number X of Book I from 1910, and Ravel’s Forlane, movement 3 of his Le Tombeau de Couperin, written in 1914-17. While the program provided many occasions for Pandolfi to show off the instrument’s fortississimo potential, there were fewer to demonstrate its possibilities in the pianississimo range, but we did have some glimpses. This well-crafted program (Notice the deftly varied dance rhythms.) was tailor-made for this instrument, which is a real gem because of its similarities to and differences from modern pianos. We hope other musicians will select it in the future to show it off again; it is truly unfortunate that the Érard sound is no longer in production. The piano is a small grand, just under 6 feet in length, with a cast iron frame and the standard compass of 88 keys, roughly the size of a Steinway L. Its sound, however, is noticeably different from the latter’s (and that of most modern pianos) in that it is more mellow with a harmonious ring, like Érards in general, whose highest notes are musical and not shrill and whose lowest bass notes have a deep but warm resonance. Its case has a lovely rosewood veneer in a herringbone pattern. The two significant facts of note about this instrument are 1) that it is a small piano with a big sound, easily capable of filling a large recital hall, perhaps even satisfactorily a concert hall, without ever sounding harsh; and 2) it originally belonged to Ingaz Paderewski, purchased by him for his Paris apartment, who gave it to Thérèse Leschetizky (daughter of Theodor) when she fled the Nazis to Paris without being able to arrange the shipment of her piano; it came to the Fredericks from her estate, which gave her possessions to the Leschetizky Association in New York, which donated it to the Fredericks, so they are only its third owners; it is in remarkably fine condition. Some images are here.